At Coker, we’re a family. No hiding in the back of a giant lecture hall here. The Coker experience is about actively creating the college story that’s right for you. With the support of faculty and staff who know you personally, there are endless ways to make that happen. Will it be GREEN MACHINE or VIOLET POWER? Who will win the race to the top of the leaderboard this Giving Tuesday? Coker Enactus’s fundraising campaign will provide resources for Myanmar community centers, empowering the people to become self-sufficient. Make an impact at Coker College! 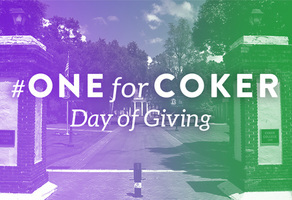 Connect with other Cobras on GiveCampus!